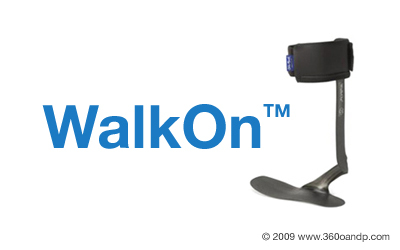 Here are a few tips to help your patients get the best fit possible with their WalkOn AFO. The WalkOn should never be worn directly against the skin, and you should make sure that there is an interface between the patient's skin and the medial strut. For the plantar surface, the WalkOn footplate can be inserted into the shoe under the shoe's insole or orthotic insert. Moleskin or other simple foam pad can also be applied. If the patient's ankle rolls medially or otherwise rubs on the medial strut, the issue can sometimes be resolved by using an orthotic insert or scaphoid pad. Moleskin or a foam pad can also be applied to medial strut in this instance. Finally, if the medial strut contacts the patient's ankle the contact edge can be softened by a Tycro wheel or other buffing tool. It's important to note that the goal is not to remove material, but simply to soften the edge to prevent skin abrasion. We hope these tips help. Thanks again for partnering with Otto Bock! If you have further questions about this or any other Otto Bock product, please contact our Product Specialty Support Team at 800.328.4058. I guess that it's not that hard really. If you can try to get it with uk best essay service, then it's going to help you a lot and you will love to see that it's one of the best for all of us.